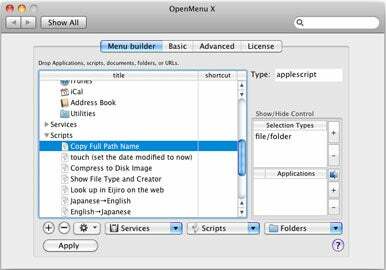 OpenMenu X is a menu-based launching solution. You can fill it with a hierarchy of things you want to launch, including applications, AppleScripts, documents, Services, and URLs. The list and organization is customizable. 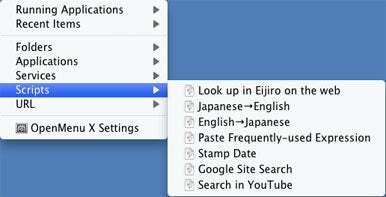 The menu itself can invoked in three different ways: a menu bar item, as part of the context menu, and as a pop-up menu. The pop-up menu can be opened either by tapping a key twice or by using a hotkey. The slightly more interesting method of bringing up OpenMenu is using the context menu. When doing this, the contents of the menus are filtered by conditions chosen in its preferences. For example, if you have an AppleScript that’s meant for processing text, you can opt to show that item only when text is the current selection. Text, file/folders, URLs, images, and empty (everything else) are available options. Additionally, your menu and menu item visibility can be specified based upon the application you’re in. For example, you may choose to only show a bookmark (URL) menu when you’re in a Web browser, or only show an application menu while you’re in the Finder. Unfortunately, it seems that in Snow Leopard, you need to either use the pop-up menu or choose OpenMenu X from the Services menu to get access to OpenMenuX’s menu in the Finder. OpenMenu X also allows you to assign hotkeys to the various items you’ve populated it with. A combination of modifier keys and another key are all that are required. Several more advanced options are available, including the ability to: limit the display of its menus to the Finder globally, reduce the font size of the menu, display icons, open folders in a Terminal window rather than the Finder, and even make folders open with Path Finder. An exclusion list is also included. OpenMenu X is a full featured launcher program, specializing in menu driven action. Its support for selected data type filtering makes it stand out for scripting users.